Portrait of Major General Alexander McDowell McCook from Carroll County, Ohio, ca. 1861-1865. He was a member of the McCook Family known as the "Fighting McCook's", a name referring to the number of family members who served in the Civil War. Alexander McCook was born on April 22, 1831, in Columbiana County, Ohio. The next year, he moved with his parents to Carroll County. In 1848, McCook received an appointment to West Point, graduating in 1852. McCook would spend the rest of his life in the United States Army. Upon graduation, McCook was commissioned as a second lieutenant. His first assignment took him to Newport News, Virginia. In August 1853, McCook reported for duty at Jefferson Barracks, Missouri. He spent the summer of 1854 in a campaign against the Apache, in September 1854, was reassigned to Fort Union, New Mexico. Between the autumn of 1854 and the end of 1857, McCook served in numerous campaigns against American Indians in the West. On January 14, 1858, McCook became an instructor of infantry tactics at West Point. He held this position until April 22, 1861. On that date, he was dispatched to Columbus, Ohio, to muster in new recruits for the Union war effort against the Confederacy. During the Civil War, McCook was one of the "Fighting McCooks." Fifteen men from the McCook family served in the Union Army during the Civil War. Fourteen of these men were officers. Alexander McCook became the colonel of the First Ohio Infantry. This unit was sent to Washington, DC, to help defend the nation's capital in May 1861. He led the First Ohio at the Battle of Bull Run on July 21, 1861. For his bravery and organizational abilities, McCook was appointed as a brigadier-general of volunteers. During 1862, McCook served in the Midwest and Mississippi Valley. 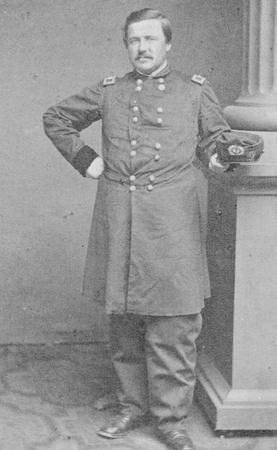 He helped organize the Second Division of the Army of Ohio and led the division during General Don Carlos Buell's attack on Nashville, Tennessee, in February 1862. McCook commanded this same division at the Battle of Shiloh in April 1862, and both he and his men performed bravely. Following Shiloh, McCook assumed command of the Army of Ohio's reserve forces and participated in the siege of Corinth, Mississippi. In June 1862, McCook led a division of the Army of Ohio into East Tennessee, hoping to protect the large number of Unionists in that region. Confederate advances during the summer of 1862 prompted the Army of Ohio to retreat to Louisville, Kentucky. McCook, now in command of the First Corps of the Army of Ohio, attacked the advancing Confederates when he was himself attacked, ignoring orders to avoid combat, at the Battle of Perryville, Kentucky. McCook's troops were hit hard during the battle, and General Buell strongly reprimanded McCook for his actions. Despite battering the Union troops, the Confederates retreated as soon as they had the chance and the Union, despite the hard fighting emerged victorious. In the fall and early winter of 1862, McCook, now under the command of General William S. Rosecrans, advanced against Nashville and then Murfreesboro, Tennessee. At the Battle of Stone's River in December 1862, Confederate forces defeated McCook's men. Rosecrans criticized McCook but retained him as the commander of the First Corps. During the Battle of Chickamauga in September 1863, Confederate forces routed McCook's men from the battlefield. Rosecrans removed McCook from command in October 1863. To exonerate himself, McCook requested a Court of Inquiry. The court found McCook innocent of any wrongdoing. The United States War Department, however, refused to return McCook to a battlefield command. He spent most of the remainder of the war overseeing federal government affairs in eastern Arkansas. On October 21, 1865, he was mustered out as a major general of volunteers. Choosing to remain in the United States Army, he served at the rank of lieutenant colonel. Following the Civil War, McCook returned to the American West, where he participated in various aggressions against American Indian peoples living there. During the 1880s and 1890s, he served at Fort Leavenworth, Kansas, directing both infantry and cavalry schools. He eventually attained the rank of major general. He died on June 12, 1903, in Dayton, Ohio.